Unable to sign in? Your institution may not have enabled it. Get in touch with your instructor to check what options are available to you. 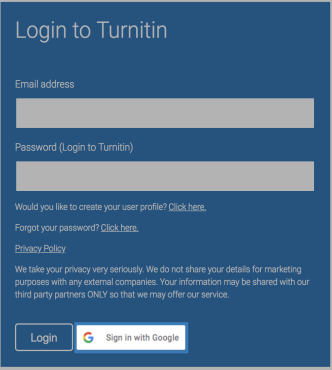 Navigate to the Turnitin login page. Select the Sign in with Google button. You'll be asked which Google account you'd like to authenticate with. Choose the one you use with Turnitin. 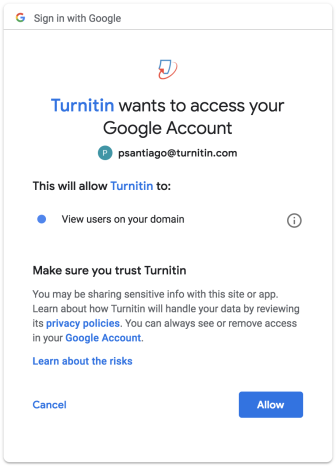 You'll be asked for permission to give Turnitin access to 'View users on your domain'. Google supplies some extra information about what you are agreeing to. If you're happy to proceed, use the Allow button. You're all set! 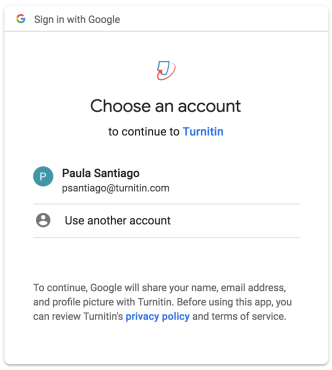 You'll now be able to use the Google sign in option to access your account.